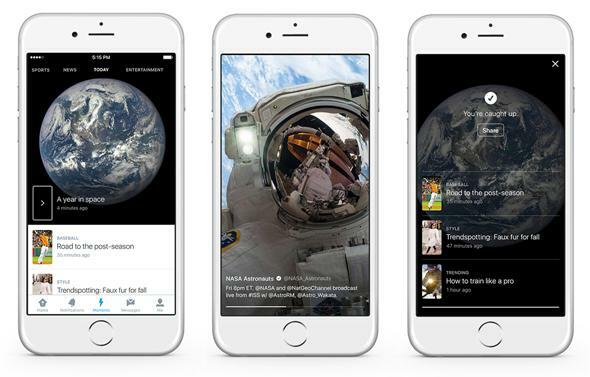 Twitter's new “Moments” feature curates tweets and multimedia into stories. The new Moments feature turns related tweets into stories as an event is unfolding. For years Twitter has been the world’s best tool for following live events as they unfold—provided you know where and how to look. But for the uninitiated, the social network has had a reputation for being frustrating or even alienating. Finally, after months of rumors that Twitter was working on a “Project Lightning” curation feature, the company announced it Tuesday. And it’s called Moments, because of course it is. Moments, which is live now, is debuting on the second day of co-founder Jack Dorsey’s return to Twitter as CEO. The timing reflects the substantial evolution Twitter needs as a company. If Moments is successful, it just might be the thing that finally gets Twitter growing again. But it doesn’t, it will be in good company. Moments appears as a little lightning icon on Twitter’s mobile app and website between the tabs labeled “notifications” and “messages.” Tap it and you’ll load a screen that looks more like a snazzy mobile news site than a social network. There Twitter has compiled a selection of the most noteworthy stories and topics that people are discussing on the platform at any given time. Click on one, and you’ll pull up a page that looks different from any other Twitter has offered. It is, as you might expect, a series of tweets handpicked by Twitter “curators” to tell the story in question—context and all. But you’re not just seeing a screen full of tweets. Instead, each tweet appears as a full screen photo or video, with the text of the tweet itself functioning like a caption. Importantly, the stories are available whether or not you’re a Twitter user. Even if you aren’t logged in, you can still find them just by visiting the Twitter homepage, where they’ll replace the algorithmically selected tweets that Twitter debuted on it’s logged-out homepage earlier this year. Twitter’s Moments are meant to be representative of the conversation happening around an issue, but they can also stand as content in their own right, and you can tweet, retweet, or favorite them. Share a link to a Moment, and it will appear in your followers’ timelines with a preview card, the way any other story link would. The implication is that the Moments tab will become a sort of alternate universe Twitter, because when someone shares a Moment, clicking it will take you to the other tab. It’s worth noting that historically, features like this that are only available on a separate tab have struggled to catch on with Twitter’s users. For now, most of the stories are being curated by a “very, very small” team of Twitter employees and product managers, Twitter product manager Madhu Muthukumar told us. But Twitter is also partnering with publications that will be able to curate their own Moments, share them on Twitter, and embed them on their own websites. Launch partners include the New York Times, BuzzFeed, and Major League Baseball, and you can see how Moments could eventually become a battleground for publishers who want their version of a particular story to surface prominently in the tab. If all works as Twitter hopes, Moments will not only be a way into the site for new users, but will also be a way for experienced users to get caught up on a story that’s been unfolding on the site. (Moments even has a “You’re all caught up” message when you’ve viewed all of your newly available stories.) You’ll also have the option to “follow” a story once you’ve looked at it in the Moments tab. For instance, if you follow a story about the South Carolina floods, Twitter will automatically drop new tweets from that story into your timeline as it develops. Once the story is over, you won’t have to unfollow it—you’ll just stop seeing those tweets. The “Moments” feature is Twitter’s attempt to address two of its biggest problems at once. One is that the site is always awash in content but lacks context. At any given time, the people you follow are having conversations about all different topics, most of which began before you logged in. You end up having to spend time figuring out what they’re even talking about before you can grasp the substance of what they’re saying. The second problem Moments is trying to solve is that it’s often hard to figure out whom to follow on Twitter. That’s especially true for users who are new to the site, but even Twitter pros struggle to know where to turn when they’re trying to get up to speed on a new topic or breaking news event. Take the floods as an example—you might have spent years building up a list of people to follow during breaking news events, and you might even follow some weather experts. But you’re unlikely to follow the very people who happen to be on the ground in South Carolina this week. And then even if you do, their tweets could still be overshadowed by the sheer volume of other people you follow talking about unrelated things. The idea of mining Twitter and aggregating the best tweets about a given story or topic is not new. It’s been done for years by the likes of BuzzFeed and Mashable. But it hasn’t been done by Twitter itself before, which always seemed a little bit odd. Now with the rise of services like Facebook Notes and Apple News—where content is increasingly being presented in a controlled ecosystem—it’s gone from an oversight to a problem for Twitter. Moments is a step in the right direction. But it might take a few more steps to change the minds of all those people who tried Twitter in the past, found it confusing, and gave up.